Hurricane Relief: South Florida's Critical Role - WorldCity, Inc.
Click here to view our Facebook photo album from the event. South Florida is playing a critical role in hurricane relief for Puerto Rico and other areas of the Caribbean. 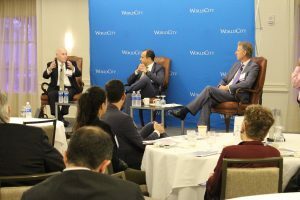 WorldCity’s latest Trade Connections event focused on how business and government are approaching such challenging times for the region. 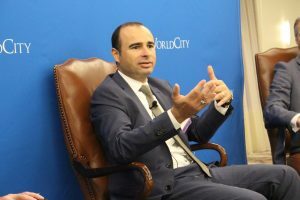 In Puerto Rico, the office of Governor Ricardo Rossello said as of October 19th only 20 percent of the island has electricity, and the goal to get to 95 percent power is scheduled to take until the end of the calendar year. Going that long without power is hard to fathom for most Americans and Europeans. 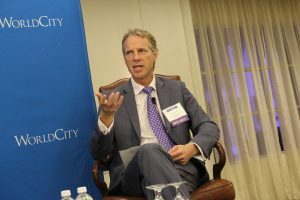 It isn’t just Puerto Rico either, as panelist David Prodger, British Consul General in Miami, noted 90-95 percent of the British Virgin Islands were also destroyed. So what is being done? Here are some of the massive on-going efforts, many of which are originating from South Florida. In a normal month, 8,000 shipping containers are sent to Puerto Rico, as part of trade with the island. Ten to 12,0000 containers holding 20 tons each were sent in a week and a half, as part of hurricane recovery efforts, said panelist Jay Brickman, vice president of government services for Crowley Liner Services. Then there has to be infrastructure in place to unload those supplies. Panelist Gregory Goba-Ble, UPS Americas region vice president of engineering, added his company has doubled to amount of aircraft going in and out of the region. Specifically for UPS employees, each received a generator from the company as well as continuous water deliveries, said Goba-Ble. “It was terrible. Our country manager stayed on (Puerto Rico). I think we made contact the third day,” said Goba-Ble. The U.S. Army Corps of Engineers has brought vessels for their crew to live in while assisting Puerto Rico, said Brickman, while the Corps of Engineers is also in the midst of sending in 60,000 concrete light poles, thousands of miles of wiring, and thousands of electrical bucket trucks. For the four British territories in the Caribbean (Anguilla, British Virgin Islands, Cayman Islands, Montserrat), Prodger estimated 500,000 people were affected, with the tourism industry that is so vital to those islands likely not rebounding until at least Spring 2018. The initial response from the United Kingdom was to get local governments re-opened with necessary institutions back in place. Hospitals, police, and treasuries were destroyed. So even if public workers were ready to lend helping hands, getting them paid was not possible initially. One audience member asked for an update on Puerto Rico’s school system, as some Puerto Rican families are moving to South Florida, as is their right as American citizens, and bringing their children into the public school system that is currently not budgeted for a potential large influx of students from Puerto Rico. “I was speaking with some of our employees. They were telling me some of the schools were starting already but part time,” said Goba-Ble. All of these challenges in the wake of vast destruction have made it more apparent than ever that the infrastructure in the Caribbean must be improved in order to better withstand natural disasters in the future. One way to help pay for that may be deregulation for those territories. It’s also an opportunity for the U.S. and British governments to find more creative ways other than raising taxes to finance development of new infrastructure that can withstand future strong hurricanes. What Prodger means is using markets to raise capital to pay for reconstruction, citing FEMA as an example, which he said wrote $100 million worth of insurance policies that paid back $1 billion in just the first year. A much more palatable option than higher taxes for citizens in the midst of recovery. 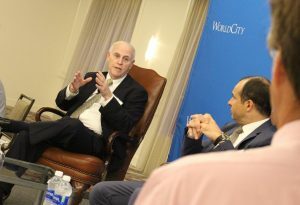 For a calendar of future Trade Connections events, as well as other WorldCity event series, click here.